Hey there! Welcome to this week's edition of Photo Art Friday - the virtual gallery where digital artists from around the world come to hang their creations. Hang any piece of your photo art that pleases you OR hang a piece that follows this week's (Feb. 1st, 2nd) optional theme of: MINIMALIST. Of course, if you do not have the time or inclination to participate in the optional challenge, you can always link up any piece of photo art you would like to share in our virtual gallery. If you are a subscriber to Photo Art Resource Cache, new textures have been posted for you and another 4 texture set will go on the site on Sunday. I know you're going to love them! If you love textures like the ones I give out here at PDPA today is your last chance to subscribe for stacks of high quality textures at the low price of $25 for 3 months. February 1st the subscription fee goes up to $40 for 3 months. You still have time to subscribe for $25! Go here to learn more and to read what some current subscribers have to say about this fantastic site full of digital resources. Good morning Bonnie! These are all lovely, and especially drawn to that second flower which I am pretty sure is a peony. Love the black background. Gorgeous! See you later! these all speak well of minimalism and just what is essential!! Bonnie, I love all of your minimalist images...beautiful processing. And I feel better after seeing them because I wasn't sure if I interpreted the prompt correctly. I'm very excited about next week's prompt - thank you for yet another free download and I look forward to using it! The beautiful flowers. They are not simple in and of themselves, but the solitary posture of each allows their intricacy to speak volumes ... I loved this exercise, though I did struggle with it. Clearly, you did not ... beautiful, Bonnie! 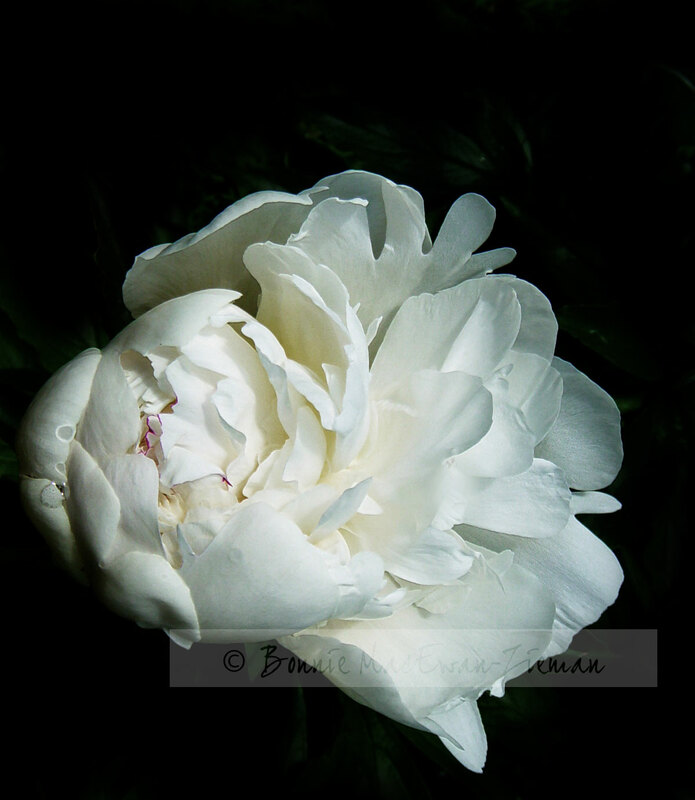 The peony is stunning against the black background. I like them all - but the white one (second) is my favourite - beautiful! It has so much depth and clarity. And there is that little touch of red in the flower. Fabulous pieces. The Orchids are stunning. There are some great photos amongst this weeks submissions. Thanks for a fascinating webpage. That peony piece is strikingly beautiful . . . my favourite! Thanks for the great challenge. it's good to be joining in this week. All the entries are fabulous...hard for me to be minimal!! Ha! Lovely images - the Orchid seems to fly out of sheer h appiness! Tried to be minimalist but ended more as modernist. 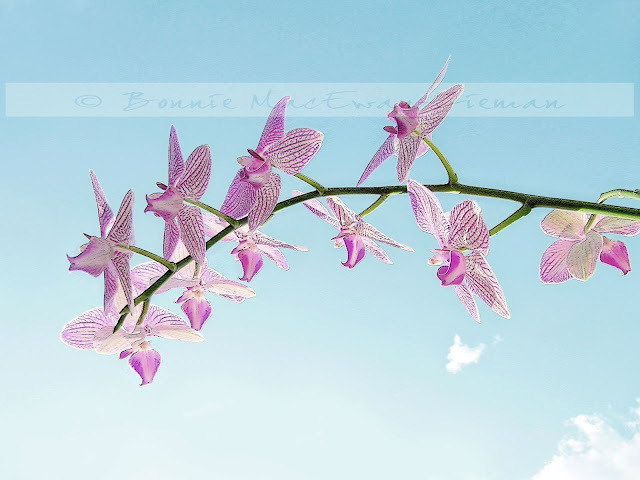 Love your orchids in the sky :) Next week's challenge certainly gives us something to work on. But, that peony is just gorgeous. Thanks again for the textures and for hosting. Wow, I really like the clarity of your flower macros, especially the daisy! 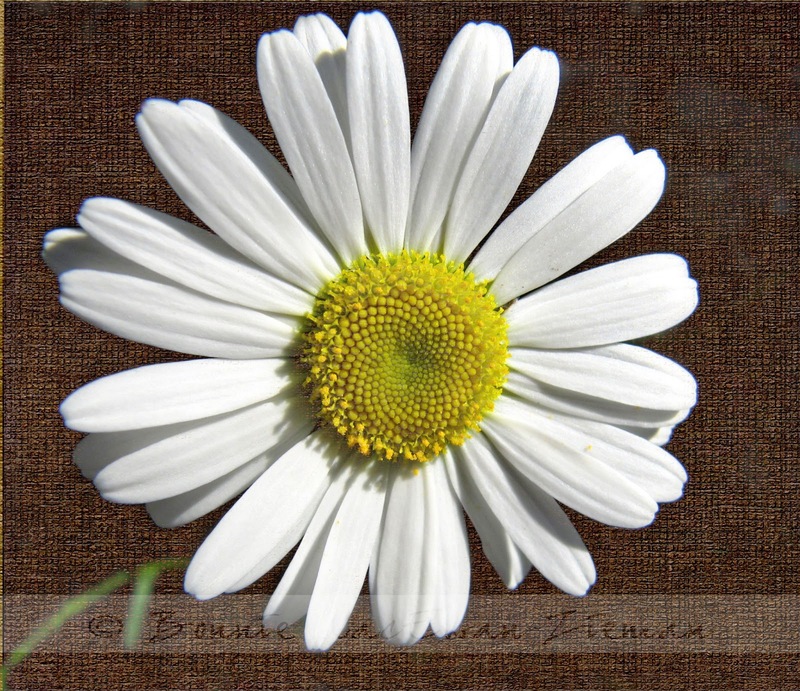 Wow, I really like the clarity of your flower macros, especially the daisy! Great images! I like a very delicate composition, I love those flowers. Fantastic work, Bonnie! Of the tree, I fell in love with the second flower (peony?) It reminds me of the wings of a swan. Beautiful! Wow! Your photo's are gorgeous! Beautiful how the image filling the frame brings us right into the essence of the flowers in the first two images. I love how the orchids on the stem seem to be flying in formation like intent little space creatures. Ljuvliga blommor.Tack för din fina kommentar. Ha de gott. Gorgeous images, Bonnie. I love the second one - so dramatic and simple.